This is two L shaped cages on the same frame. The center is a little area to keep chinchilla supplies. The outside is all plexiglass. We are still going to build a base with removable bins for easier clean up. Also, we are going to cut out Doors in the front plexiglass. The center section is made so that we can slip a divider in between the small part of the L and the big part. So when the chinchillas have kits, we put the divider up until the kits can jump around. I think the main concern was the fact that it was closed off. I don't know if the air was fresh enough, but they definitely weren't overheating in the cage. The apartment where they were kept was cool enough and they didn't look hot. (By checking their ears) A few months later we moved houses and moved the cage to the basement, where it was basically always cool, even in the summer. At this point I've sold the chinchillas and no longer have any. The removable bins at the bottom were amazing and I would consider necessary. One addition that I wanted to make but never did was cutting vent holes into the plexiglass at the bottom and at the top. Then I wanted to mount computer fans to keep air circulating. The only challenging bit is cutting the plexiglass in a way that looked good but didn't expose them to the fans. One more thing to note is that by the end of its life, I had replaced a few ledges of the cage, but I had always intended to do that. A change to construction I would have made is for the main supports. I would have those be made out of something they could not chew, because I had to replace one of those pieces which was not intended. I strongly encourage doing your research on materials that are safe for cage construction before beginning. This cage is fantastic but how are they getting fresh air?! I am a long time chinchilla owner and have wanted a cage with solid sides for a very long time due to their tendency to kick out shavings. Your cage looks great! 1. Do you have more detailed instructions posted on how to build a similar cage? 2. I'd like to build one with a removable divider in the middle to separate the parents after they breed, but so they can still touch each other through the wire. Suggestions? 3. What type of wood did you use? 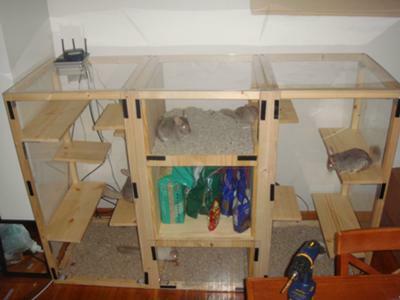 My primary concern is the safety of the chinchillas and building a cage that's easy to clean. I'm currently using the chinchilla mansion from Quality Cages. Join in and write your own page! It's easy to do. How? Simply click here to return to Cage ideas.